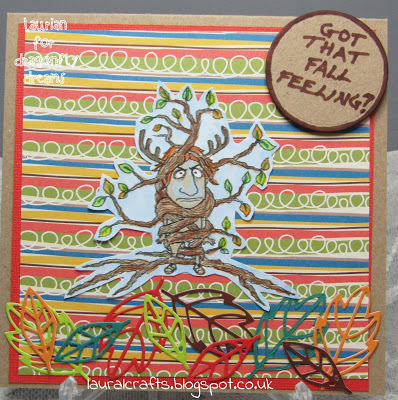 Outside the Box: Tree Hugs at Dragonfly Dreams! The November challenge at Dragonfly Dreams has begun and this month we would like to see your projects using Autumn/Fall colours! Our sponsor this month is SLS Lines and they gave us some images to play with! He is just such a fun image! I coloured him with Promarkers and then fussy cut out, The background paper is from Craft Asylum - I have used this pad to death for all my autumn projects I love it! I cut out some leaves using some Tattered Lace dies in different autumnal colours and the sentiment is hand written. We would love to see you over at the challenge sharing your autumn projects and you have a chance to win 3 digis from SLS Lines!